Just over a year ago, I made a discovery that changed my life (or at least my internet usage). While searching the web, looking for ideas for a baby shower I was co-hosting, I stumbled upon this wonderful and inspiring invention called The Decorating Blog!! I was immediately and forever hooked. Amazing sites like Miss Mustard Seed, Under the Table and Dreaming (the first blog I ever followed) and Emily A. Clark, were just a few of the blogs that made me look up from my iPad and wonder where three hours just went. I discovered a way to feed my decorating/home decor addiction that I never dreamed possible. So what does one make their first decorating blog post about? Well how 'bout I let you know why I chose my blog's name; The Concrete Cottage. It's very simple. In January of last year, my family moved into the house my lovely husband built for us (with much help from me, even if he won't admit it) made out of all concrete. ICF or Insulated Concrete Forms to be exact. Never heard of them? Well you're not alone. 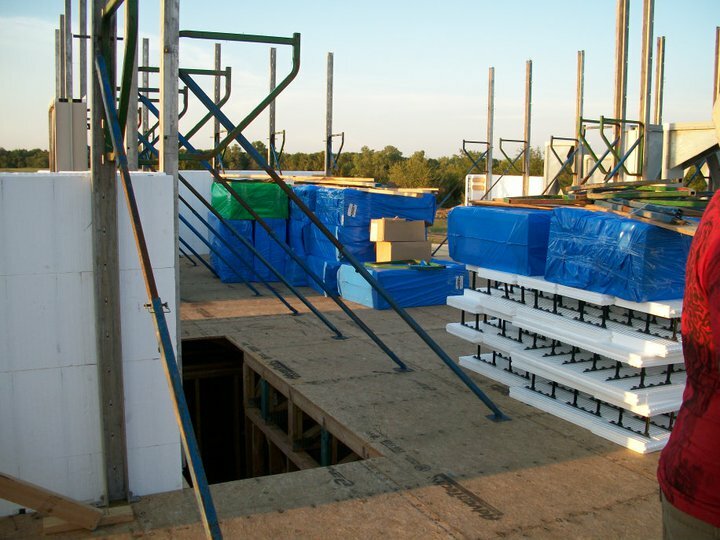 Those white "walls" you see above are actually hollow styrofoam forms that get stacked up like Legos and filled with concrete. 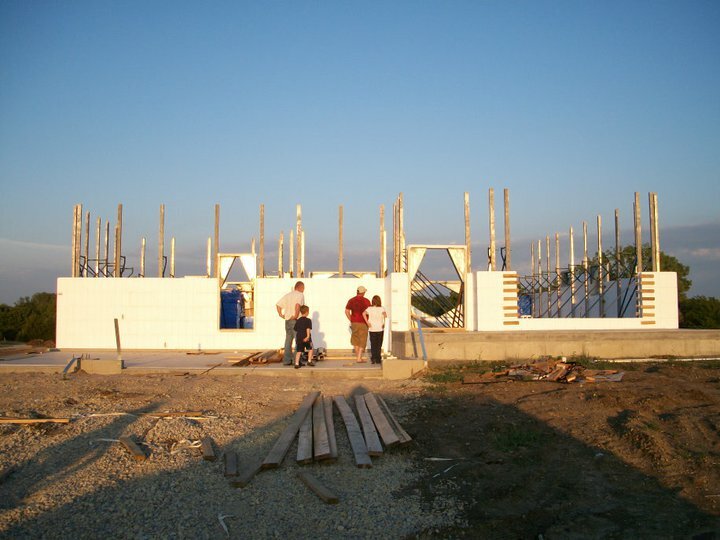 The above picture shows the forms laying on their side. The concrete gets poured down the center where you see the black supports. Anyway, it's uber "green" with all that insulation, etc., but more importantly, it's safe. Living in this tornado alley we call Kansas, it only made sense to build a house whose walls could stand up to the occasional rough weather. And when you're married to a man who's Mr Concrete himself (17 years with Beran Concrete)... was there ever any other choice? I can't wait to have you all come inside and share my craziness as I attempt to turn this "tornado shelter" into a home!! Love it!!! Very descriptive, and of course you know I'll be stealing all your ideas!!! Neener!!! I'm soooo happy you've started your blog!!! I can't wait to read all about everything you do!! Miss you and love you! who knew a tornado shelter could be so cute! If I ever find myself moving that direction I will have to find one for myself...never know with a military man! WOW girl your home is beautiful!! I would say I don't know how I missed it but that would be a lie lol I got distracted by your cute bee jug. I also love, love the lat. lon. signs. I hope your working on more projects to post so I will have something to look at at 3am on a sleepless night lol. Found your blog through the link party at Redoux Interiors...loved your Harry Potter wall! As an avid reader, I've been wanting to try my hand at that..this just makes me want it even more. I, too, just discovered all the decorating blogs and DIY blogs..as well as Pinterest...How did I not find these sooner?? I also have begun the process to start my own blog, not sure yet how to put it all together, so it sits as a half-finished project on my laptop...lol. Hi Jeannine, I'm another 3 a.m. reader ... well, actually, now that I've gotten done reading ALLL of your wonderful posts and finding myself begging for more, it's about an hour later. You DOG (woof, woof! ), I am so jealous. I found you after you were featured on the Silhouette America blog with your FABBBBBBULOUS Harry Potter wall. My God woman, you have got to be the most patient person on the face of the Concrete Planet!! Annnnywhooo, I love your blog and you deserve FAR more than a Liebster. LOL, when I won it, the max followers one could have was 100 (not 200), and now I'm about to hit 1200! I don't do anything nearly as fabulous as you, I only make cards and such, but I am heartened to hear that you started out here in blog land looking for ideas for a baby shower. Yup, and I just got my iPad in May so the glazing over is just beginning. (And when I write long comments like this, I stick to a 10-fingered keyboard at my desktop -- good grief, who can peck out more than a sentence on that thing?! Though I LOVE my iPad 'cause it's great when I am in the middle of an addiction like looking at blogs (oh, go to HOUZZ.com and you'll hate me for referring you to THAT time sucker of a house decorating blog!! ), I can sneak the iPad under the covers and hubby is somehow tolerant. It reminds me of when I was a kid and used to read comic books (ARCHIE!!) by the light of a flashlight under the covers WAY after bedtime! Hmmm, wondering ... I love how you repurpose old furniture to make them look shabby chic. My craft room is loaded with old dark brown furniture -- cherry and mahoghany -- that I used to love and have in my living room but I SOOO want it white. It's likely too big of a project to undertake at the moment, but your vanity for Morgan is inspiring.